The Interpretive Trail Sign Solution For Everyone! A Complete Solution For Your Next Trail Project! Reduce Costs and Speed Up The Design and Development Process! 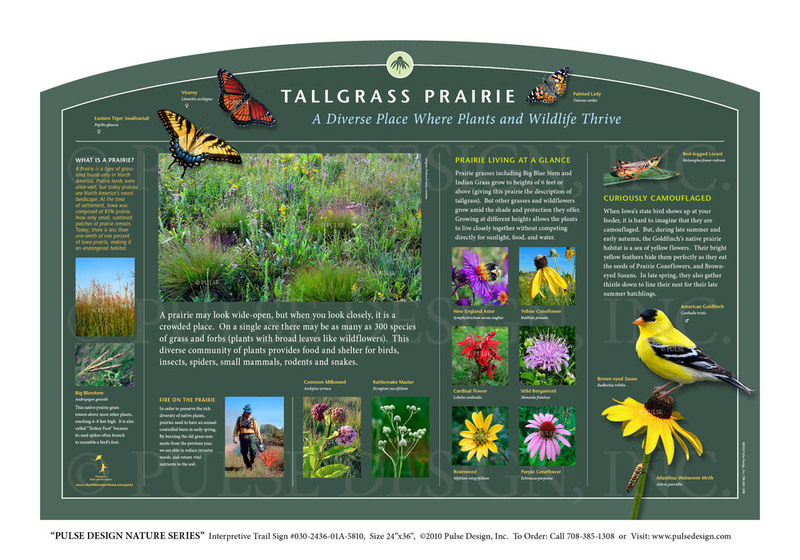 We are proud to offer the PULSE DESIGN NATURE SERIES which is a beautiful, "Ready-to-Order" and "Customizable" series of interpretive trail signs that cover many common nature subjects. This product is perfect for projects with a modest budget and short deadlines. With over 100 signs to choose from, and a 10 year manufacturers warranty, we are sure to have something that will suit your needs. If we don't have it, we can make it special for you! These signs feature colorful, high quality photographic imagery that our customers fall in love with. You can view all of our signs here on the website and also in our New 2016 PDF Catalog. Click on a sign sample above or catalog page below for enlarged view. Download Interactive 2016 PDF Catalog to see all of our signs and read even the smallest text. “Oh my goodness are your signs great! — Emily Koczela, Brown Deer School District, Wisconsin. Ordered set of 21 signs for Brown Deer School Campus. We have grouped our signs into 10 main sections based on habitat or topic to make searching easier. We have also created 5 sub-sections that regroup the same signs from the 10 main sections into 5 kingdom types. Click a sign category below to get started. We have added search functionality to our Nature Series trail signs. Type the "common name" of a plant or animal, a habitat, or a topic you are interested in. If it is currently on any of our signs, your search results will show a thumbnail image list of each sign and a text description. Click any search result to see that sign larger. © 2015 Pulse Design, Inc. All rights reserved.